where P is the pressure, V is the molar volume, R is the gas constant, and T is the absolute temperature. The parameters a and b introduced into the ideal gas law have physical significance. The term b is subtracted from the molar volume to account for the finite volume of the molecules in the system. This is called the excluded volume effect. Finally, the term is added to the pressure to account for attractive interactive forces among neutral molecules. These forces have come to be known as van der Waals forces. Van der Waals forces or interaction energies between molecules and colloidal particles are considered to arise from three types of interactions, resulting in what are known as Keesom-van der Waals, Debye-van der Waals, and London-van der Waals forces. These are also termed orientation, induction, and dispersion forces, respectively. Interactions between polar molecules are termed Keesom forces. Interactions between nonpolar molecules that can develop a dipole moment in an electric field are termed Debye forces. The Keesom and Debye interactions have been characterized using classical electrostatics. The third interaction, the London-van der Waals interaction, is quantum mechanical in origin. It acts between all atoms and molecules including totally neutral ones such as carbon dioxide. The resulting forces are often called dispersion forces because of their relationship to the dispersion of electromagnetic radiation including ultraviolet and visible light. The London-van der Waals forces between two atoms are the result of fluctuations in the charge densities of the electron clouds surrounding the nuclei of the atoms. Stated another way, although for a neutral atom the time average of the dipole moment is zero, there is a finite dipole moment from the instantaneous positions of the electrons about the nucleus. These instantaneous dipole moments produce electric fields that polarize any nearby neutral atom. The resulting interaction between the two dipoles produces an instantaneous attractive force between the two atoms, the time average of which is not zero. For most molecules, dispersion forces dominate the van der Waals interactions in a gas. For example, they contribute essentially all of the van der Waals interactions between methane molecules in a gas phase . For a polar molecule such as water, however, interactions between the permanent dipoles (orientation effects) contribute some 69 % of the theoretical interaction energy, with dispersion forces providing 24 % . There are two theoretical approaches to determining the van der Waals interactions between colloidal particles or between colloidal particles and larger objects. In the older, classical, or microscopic approach, the interaction between two such bodies in a medium is obtained by a pairwise summation of all of the relevant intermolecular interactions. This approach results in relationships that contain a geometrical component and a constant, A, which depends on characteristics of the two bodies and the medium. The development of this approach was primarily by Hamaker  and the constant (A) is termed the Hamaker constant. The second approach was suggested by Lifshitz  and is called the macroscopic approach. In it the assumption of pairwise additivity is avoided. The total interaction is obtained from considering the macroscopic electromagnetic properties of all media. Each of these approaches is summarized briefly here. 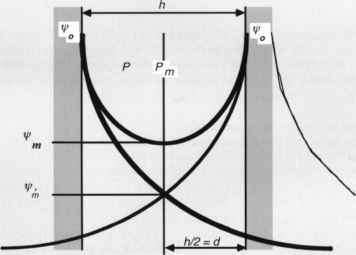 The Hamaker or microscopic approach to determining van der Waals interactions is based on the assumption that the attractive force between two particles, each of which consists of many atoms, is the sum of the interactions between all pairs of atoms on the two particles.